WOW, these Wednesdays sure do pop up fast. I can not believe how fast the time is going. It's Halloween and it will seem like in the blink of an eye it will be Thanksgiving. How do you slow life down???? 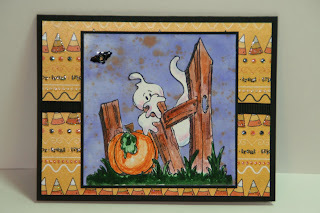 Here is my card for the Sketch Challenge at Split Coast Stampers this week. It was a simpler challenge I thought. And I welcomed it. I am swamped with craft fair stuff (it's on Saturday) and I just HAD to stop and play with today's sketch. I know, it could have waited. I'm pretty positive that the Split Coast Stampers Sketch Challenge police would let me enter it on the weekend!!! LOL But if I didn't do it today then I would just let it slide and probably not do it at all. SO here it is in all it's sparkling glitter!!! I used the "Let it Snow" stamp from the "Big on Christmas" set. I used the snowflake Cuddlebug folder on my background papers. 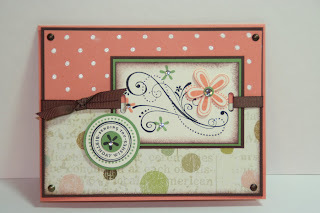 I used the wonderful "Photo Corners" punch that just came out this summer in the new Stampin' Up! catalog. This punch has come in handy on many occasions!!! It sure saves a LOT of time and beats making your own corners. 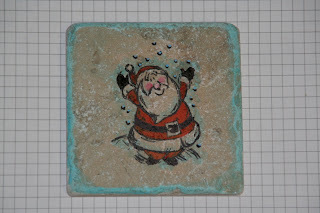 The snowman face is stamped separate, cut out and mounted using Dimensionals. I used Crystal Effects and went over the letters and then sprinkled them with Dazzling Diamonds. I added a little to the top of the hat too. It looked like it needed a little bit of sparkle there! It was a pretty easy and VERY fun card to make. I have been tagged by Diane over at My Little Stampin' Spot and by Paula at Crop Notes and Crafts. Thanks Diane and Paula for tagging me. I've played this one before so I will be passing on it this time around but be sure to stop by their blogs and have a look see! I actually used up a full sheet of decorative paper!!! Shocker! I am not having withdrawals either. I don't feel a desire to run out and purchase some more to replace it! And I'm thrilled I don't have any of that sheet just sitting around! Here is one of the cards I made (the other one is just like it!!!) LOL The top part of the card is Groovy Guava and I used the "Polka Dot" background stamp and embossed the dots in white. The primary set I used is "Priceless." I just LOVE that set. And I also used "Circle of Friends" for the sentiment. I added some ribbon, brads and gems. If you click on the photo (you can do this with all my photos) you will see a larger image. Notice the glitter/shimmer on the dotted swirls? I got this fun fine line glitter pen called Gelly Roll. The glitter is ultra fine and when you use it on some colors it looks like gold and using it on other colors it looks like silver. It just seems to morph into gold or silver depending on which one you want it to look like. A VERY fun pen!! SO, here's the birthday card and I'm sure they'll like them! I did. A few weeks ago a package arrived at my home from the UK!!! I won Blog Candy and forgot all about it. When things settle down here I am going to be playing with it. I especially LOVE the little clear stamps. I can't wait to make a card with it. And Oh My, those snowmen brads. You know me and snowmen. I'm going to be having a lot of fun with this candy!!! I won the "Candy" from Jenny at Stamping Moments. Take a few moments to check out her blog. Right now she is featuring a pop up Santa card. And if you scroll down just a little she shows you how you can make a 2" circle with your tab punch. In the meantime you can visit Jenny's blog and continue to read mine daily!!! You wouldn't want to miss a day now would you??? This paper had a touch of what I thought looked like Groovy Guava so I used that color in the card. The smaller piece behind the stamped image is Groovy Guava with the Linen Background stamp on it. 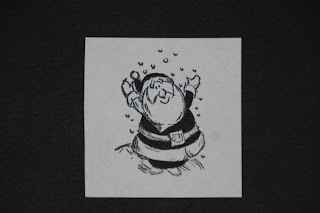 I used Chocolate Chip ink and inked off once before I put the card stock down on the stamp. I didn't want it too dark. Stamping off gave it just the right touch of color. I sponged the edges to tone it down a bit too. And I also sponged the edges of the decorative paper. Not to tone it down but to help it blend better with the layering. I stamped the image on watercolor paper using black Staz On ink. I used a blender pen to add the color. I could not locate my corner ticket punch so I had to fake it!!! Shhh, don't tell anyone!!! LOL And I added antique brads to the corners, they looked a bit empty. I tied on a piece of Wild Wasabi ribbon and assembled the card. After seeing this I wished I would have put the flower one together instead. I'm not sure who'd I'd give a card like that too. I'll have to think about that one for awhile. 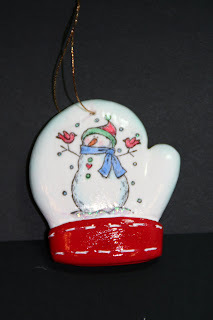 Here is an ornament I made using a flat ceramic bulb I got at Michael's. They are in the Christmas section along with the clear glass bulbs and holiday rub-ons. Katie brought her stamp set with her on Friday night so I could play with it. Isn't she a sweetie??? Again I used the tissue paper technique. I stamped the image on the tissue paper using black Staz On. I colored it in with colored pencils. I set the tissue paper on top of the bulb. I centered it and ran my finger around the edge to know where to trim it. After trimming it I spread a layer of Crystal Effects on the bulb and set the tissue paper in place. I then spread a little more Crystal Effects over the top of it and while it was wet I rolled the edges in the Dazzling Diamonds. After it dried I added a little more Crystal Effects to the star and sprinkled the area with more Dazzling Diamonds. When that dried I tied a ribbon on and added a bow. It's now ready for my Christmas tree. 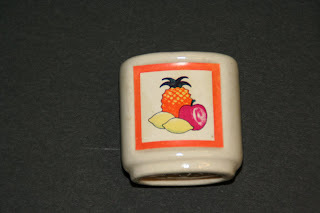 Believe it or not I have had this little toothpick holder for years and years and years. I do not remember where I got it from I only know that I've had it forever. The picture on the front is made of paper and stuck on with the paste that is used on envelopes. Ok, here's the really sad pathetic thing about this toothpick holder. We actually used it. This thing sat on the Lazy Susan and sort of got lost among the pepper grinder, napkin holder, salt and pepper shakers and the matches for the grill that didn't self-ignite anymore!! The other day I picked up this little toothpick holder and thought it needed a face lift!!! SO I soaked it in water and the paper design came right off. A BIG improvement to the toothpick holder right there!!! I dried it off and set it aside for a few days. I picked it up today and knew what I wanted to do with it. I stamped the snowman image on tissue paper. I colored it in with colored pencils and used Crystal Effects to affix it to the holder. I did put Crystal Effects on the holder first, laid the tissue paper in place and added a little more Crystal Effects. After it dried I thought it needed something so I took this bottle of pretty icy blue Stickles and went around the center edges with it. A big YUCK on that one!!! I scraped it off and wiped it clean. Thought about it for a bit longer and decided I'd use the micro mini beads on it. I think it gave it an icy look. Makes me chilly looking at it!!! I am still not 100% happy with the way it turned out and I may take the beads off and put a light blue edge around it first, then add the Crystal Effects and sprinkle the beads on again. I think it needs just a touch of color around the edges there. But as is I like it a lot more than the original form. I can't believe I kept that design on there all these years. Maybe I never really noticed it because I usually had the design side turned away from me!!!! Check on the right side of my blog in the Labels area. There are several other items I've made using the "Tissue Paper" technique. I can't believe I forgot to do the drawing for the Blog Candy. Ok, I do believe it. I've been SO forgetful lately as it is!! I need this set, because I don't have it. And because I LOVE flower stamps and I can't get enough! Thanks for the chance to win! Please email me with your snail mail address and I will get the stamps off in the mail to you. If I don't hear from her by Tuesday October 30th I will be putting the candy up for grabs and we'll do another drawing! Thank you all for playing. And guess what happened while we were playing that game? Yup, the blog went over 160,000!!! SO we all know what that means!!! More Blog Candy. I will be putting more up early next week. And I believe I will be hitting the 500 posts mark too so more Blog Candy will be posted for that. WOW, you're going to get a toothache from all that candy!!! These boxes are found on Split Coast Stampers website. There is a file you can download to your computer and print them out as you need them. There is a little margin issue but my printer asked my computer if it wanted to go ahead and print and I clicked yes and it just cut off the one side a little but you just improvise and can figure out where to cut and you're good to go. By seeing that I have 5 of them on display you can see these are pretty easy and quick to make. The snowflake one holds 2 York Peppermint Patties. The Halloween one has 3 mini Tootsie Rolls in it. The other 3 boxes have bath salts in them. The bath salts are in a small zip baggie. Actually there are 2 small zip baggies with bath salts in them in each box. Aren't they just the cutest little boxes??? These would make fabulous thank you gifts, Hostess gifts, Customer Appreciation gifts. They would also be great for Stamp Camps and Craft Fairs. Again this is an item that there is no limit to your imagination. Put little cookies or a cookie in it (I'd recommend using waxed or parchment paper on the inside when using unwrapped foods). The link to the pattern can be found here. They were designed by Brenda Quintana. She holds the copyright to them so be sure you don't sell the pattern to anyone! It's not yours to sell. Have fun with these! This past Sunday I was able to attend our monthly DIVA meeting my upline (Sue) has. I need to take a moment here to tell you what a fabulous upline she is! She shares SO many ideas and techniques with us. We have swaps within our group. There's dinner and a meeting. All that usually followed by a project and a challenge to complete and bring to the next meeting. We all leave there SO inspired and ready to head out in our little business world and share it with our customers! Oh and at the meeting there is a time of sharing what you make. I refer to it as "Show N Tell!" Several of the demos bring in their cards and 3D projects. And that brings us to today's post! This little pick idea from Gerry doesn't have to stop with just Halloween. There are LOTS of stamps out there that can fit in the dimensions of the punches. 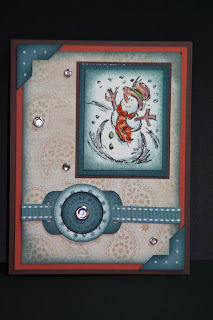 The punches I used were a 1", 1-1/4" and the new Scalloped one Stampin' Up! came out with this year. I LOVE the size of it. I have used it in many projects and using it along with other smaller round punches gives you such depth on your projects! Have fun with this project, it has endless possibilities. I just can't believe how fast these Wednesday's sneak up on me!!! I really do look forward to these challenges. I really enjoy having different layouts to use for my cards. I like this one and will probably use it again on another card. Most of the sketches I've done on Split Coast Stampers are ones I will and have used again. If you haven't done a sketch, give it a try. It keeps you thinking that's for sure. Plus you get to see all the other participants cards too!!! I love seeing what other people come up with. Some are extremely elaborate and others very simple. You get a big variety of skill levels there. 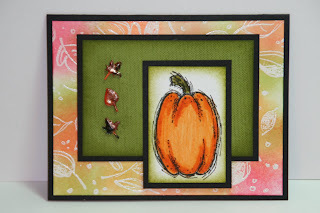 For my card I used the Autumn Harvest and Linen set. I also used the Leaves Awash wheel on glossy card stock and with Versa Mark. I heated clear embossing powder and then sponged the colors on. The brads were gold and I heated them up and dipped them in embossing powerd. I had 3 colors, an orange, a green and a brown. I colored it all orange to start and then dipped one edge in brown and heated it and then another edge in green and heated that. Each one is different and should be!! I wasn't sure if I wanted ribbon in that large empty space or the brads and once I colored the brads I realized it was just what the card needed! 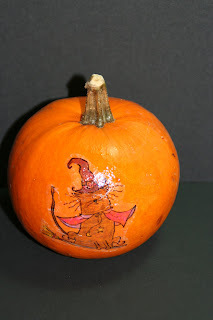 I stamped the pumpkin on watercolor paper and black Staz On ink. I used a blender pen and the Pumpkin Pie marker and colored in the pumpkin. I added a little Old Olive and a touch of Always Artichoke to the stem. I sponged the edges in Old Olive and layerd the pieces in black card stock. I assembled the card and VIOLA here it is!! Such an easy way to dress up a sucker! I got these "Iced Pumpkin Pops" at the Dollar Tree for another project and needed to use them up. I'm not a sucker fan so I knew I wouldn't be eating them. SO the next best thing is to dress them up and give them away!!! LOL SO I borrowed the "Batty For You" stamp set and off I went!!! I have a couple more projects I want to do with the set before I return it. But if I have to return it early I suppose I'll drop it off. (This is a message for the owner of the stamp set!!! LOL). I should be done with it by tomorrow night. Anyway. These were very easy to make but a lot of punching. 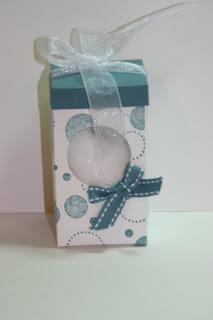 The scalloped punch (a new and welcomed addition to the Stampin' Up! punches), the 1" circle punch (another new addition) and the 1 1/4" circle punch are needed to make yours look like these. I used Staz On ink. I'm not sure why. I like the crispness of it and to me it seems to be blacker than the Basic Black ink pad. I taped them all together and then I taped them onto the sucker wrapper. No, don't remove the wrappers. EWWW. I thought they turned out cute and I'm going to set them out for my stampers this week. These would be a great item for kids to make since there isn't any coloring, just stamping on colored card stock. You could do the stamping and they could do the punching or they could do the taping. There's a little job in these for everyone! 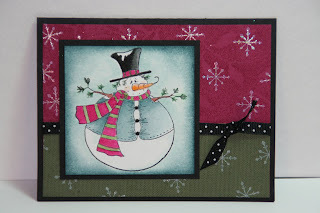 This little snowman is from Plum Purdy Stamps. Isn't he just adorable? The set is called "Too Much Snow." Can you believe that??? Is there such a thing? ?You know how much I LOVE snowmen. I think I'm on a quest to own all the cute snowman that are out there!!! I saw him on someones blog and they posted a link to it and I knew I just had to get it. The place takes PayPal and I just happened to have a few bucks left in my PayPal account and I just couldn't resist. I used the "in" colors on the card. Well, except for the black and Always Artichoke. This set came with a snowflake stamp too so I just HAD to use it. I mean, how can you have a snowman without snowflakes??? I used the "Fine Lace" background stamp on the Purely Pomegranate card stock and I used Purely Pomegranate ink as well. On the Always Artichoke card stock I used the "Linen" background stamp and Always Artichoke ink. I like to use the matching ink over Versa Mark. I wanted the colors a bit darker and richer looking. I added the ribbon before I assembled the card. The snowman was stamped on watercolor paper using Staz On black ink. I used a blender pen and colored in the image. I did use the Garden Green marker on the pine tips. I also added a little bit of Pumpkin Pie ink to the underside of the carrot nose. The Groovy Guava just wasn't dark enough. He was a lot of fun to color. Before I assembled the card I stamped the snowflake on using Craft White ink and I embossed it with iridescent embossing powder. It gave it that little bit of sparkle, not too much but just the right touch. I'm going to have to play with that stamp a bit more, it was a nice break for me. Now it's back to craft fair items and I'll post them on here as I make them! 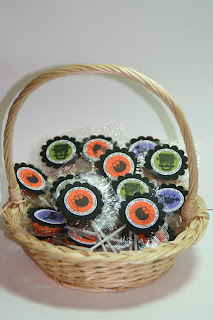 It was such a busy week last week that I didn't get time to put up the Blog Candy for the 150,000 hits! So here it is! Better late than never, right??? 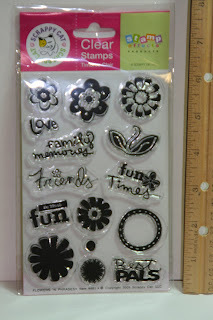 This is a brand new set of clear stamps by Scrappy Cat and the theme of this set is called Flowers & Phrases. To get this set you just need to tell me how bad you need it. Need it??? Or should it be "want it? Either way. I will put your names in a hat and draw from there on Friday morning. I was looking at the random number generator program and I entered in numbers 1 - 10 and some numbers appeared twice while others were missing. SO in all due fairness I will no longer be using that piece of technology!!! I'm putting a ruler up next to the set so you can see how big it is. 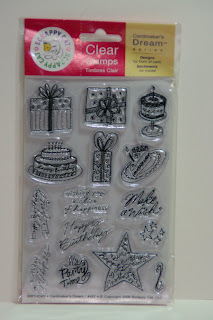 I saw these sets at http://www.addictedtorubberstamps.com/ and they were going for a bit over $17!!! Such a deal!! Ok, just leave your comment to this post only as to why you need/want this set and I'll draw a name on Friday morning. Using the Anywhere glue stick by Stampin’ Up! 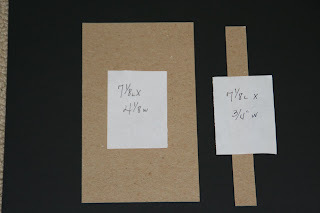 Glue the chipboard to the backside of the decorative paper. Start with the small 3/4" strip and then add the larger piece. I used a toothpick set between the pieces to space them evenly. (Click on the photo and you'll see the toothpick better) I did this immediately after I set the large piece down. Do it right away while the glue will let you move it a little. Set it aside and repeat for the back piece. When you have finish ed with that, clip the corners. Leave about 1/16" so it will fold over nicely on each edge and not show any chipboard. Once your corners are clipped fold them over and glue them in place with the Tacky glue. 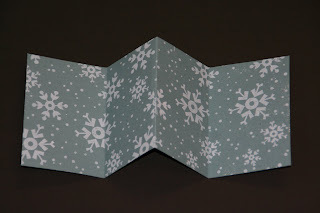 Cut two pieces of white copier paper, or you can use contrasting decorative paper) 4 ½" x 6 7/8". Using the glue stick, set in place over the exposed chipboard. Cut your white copier paper 4 3/4" x 7"
Now for perfect hole placement take one of your copier pages and fold it in half so it is now 4 3/4" x 3 ½". Fold it once more. Now find the center of that area (you can fold it once again to find center or you can measure). Take your Crop-a-dail and punch all 4 holes at one time. Open up the paper and use this as your guideline for your pages and for the cover. Set your Crop-a-dial to about 3/8". Mine was set shorter and now that I look at the book I wished I would have moved it inward just a bit more. But you didn’t notice it until I just pointed that out to you now did you??? LOL Using your paper hole template mark the areas for the front and back cover too. Punch them out. Your book is now ready to assemble and stitch. The stitching instructions look long but they are very detailed and easy to do. Sandwich your copier paper between the covers. Taking a piece of hemp about 40" long, thread it through a large darning needle. 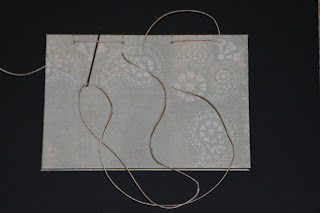 You can try to bind the book without a needle, it can be done but it is more difficult. Holding the book in front of you so you are looking at the top, take your needle and insert it from behind in the last hole. Draw the hemp through leaving about a 2" tail. Come back around and enter the same hole. Holding on to the tail, go through the hole again. Draw the hemp tightly around the spine. Now go across the top to the next hole. Here you will be working from the front to the back. Insert your needle in the hole, coming out the back. Bring your needle back to the top and insert it in the hole again, you want two threads around each hole... The front of your book will have one long stitch. Now take your needle and come up from the back to the front. Insert it hole on the back again and your needle will now be in the front of the book, repeat so you have two stitches on the spine. Insert your needle in the final hole, coming out the back.. Come back through that hole again. At this point your needle will be hanging off the back of the book and you will have two stitches on the front of the book and one on the back. Now you will take the needle and insert it in the second hole on the back. Creating another stitch on the back. You will have two there now. Coming up in the front you will go to the next hole and come out the back. Your front how has 3 stitches. Bring your needle through the last hole, coming out the front. Now go back on the top only, no spine stitches and just go in and out every hole and coming back to the bottom. What you are doing here is making two stitch lines coming out of each hole on the front and the back. Tie the knot in the back and add a little tacky glue to hold it in place. When the glue is dry cut the excess off. You can always work it out so the threads are in the front and you can tie them in a bow and decorate around it. Your book is now bound and ready to decorate as you wish. And yes, there will be 3 strands around the spine on the last hole. And I ended up with about 10" of excess hemp. You can cut your 40" a bit shorter if you want but it gets difficult to work with if it’s too short at the ends. Tie the excess in a couple of bows and save it for another project. It’s a fun and fairly quick project. I hope you have fun with this. These make very elegant looking books and depending on what you use to tie the book you can really make them classy! They're great for Stamp Camps too!! 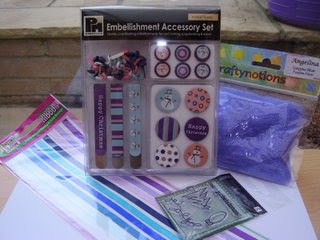 There are SO many mediums you can stamp on and using the tissue paper method opens up all kinds of doors for you. Doors? Yes, you probably could stamp on a door using this method!!! I find more uses for it all the time. 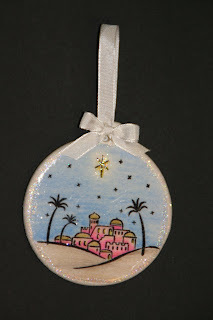 Like this week with the plaster ornaments!!! I am really happy with the way this snowman turned out on the mitten. I plan on making several of these for gifts and craft fairs. The cuff of the mitten would be a good place to add a name to personalize the ornament or you could add your holiday sentiment! Something For The Tree! & Directions Too! It's amazing the things you can find to stamp on. I found this adorable snowflake at JoAnn's. It's 2 - 3/8" in diameter and made of plaster. I put a couple layers of white acrylic over the top of it and then proceeded to do my stamping. Isn't it just the cutest snowflake? They're back by the ornaments! I also bought a mitten one and will be showing you what I did with that too! But not tonight. I removed the gold cord that came with the ornament. You could untie it and reuse it, that is up to you. Like I said I painted the snowflake with white acrylic paint, both sides. It absorbed VERY fast and was dry in no time. I have several of them to do and if I were to paint them all at one sitting, by the time I got done with the last one the first one would be ready to handle. I sponged the edges with the Soft Sky ink pad. It had more of a wintry look than the Bashful Blue. I set it aside. 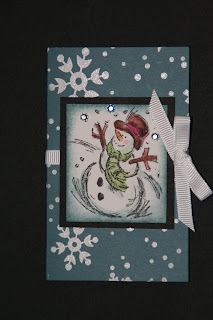 On white card stock I stamped the face part of the snowman, the smallest one in the set, using the black Staz On. 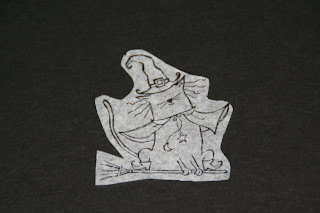 Then I stamped the nose on the white using the Pumpkin Pie ink pad. Now I thought the nose was a bit too long for this little face so I trimmed it down a bit. I took the 3/4" punch and lined up the smile close to the edge of the punch (looking at it from the back of the punch) and I punched it out. I sponged it with the Soft Sky ink and set it aside. Add your glitter to the edges of the snowflake and allow it to dry. Click on the photo to see a closer view, you will be able to see my glitter. I used a Gelly Roll Glitter pen. It writes like an ink pen. While that is drying take the yellow piece of card stock, the hat stamp and the black Staz On and stamp the hat image. Cut it out. Don't worry about getting the flower exact, I hid mine with a clear gem. You will be adding that on after you assemble the snowman on the snowflake. Back to the snowman head. Glue the nose in place. I used regular Tacky glue for that. 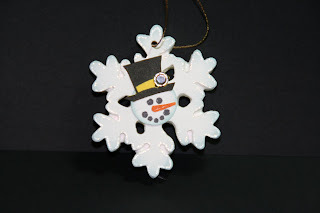 Place a dot of the glue on the back of the circle and set it in place in the center of the snowflake. Turn the head just a little so you can add the hat on at an angle to give the snowman a bit of an attitude!! Add the hat using the Tacky glue. I used the Crystal Effects to adhere the gem. I'm not sure if Tacky glue will stick as well or as long as Crystal Effects will. 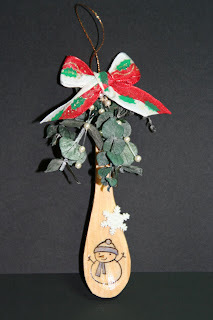 Put the hanger back on and your ornament is ready to hang on the tree, use for gifts or sell at craft fairs. It's also a wonderful gift for your customers or hostess! Hopefully we have a winner this time!!! If not there's a 3rd chance drawing!!! LOL And if we do that's ok too because during this second chance drawing my blog went over 150,000 so I'll be offering more Blog Candy on Monday. 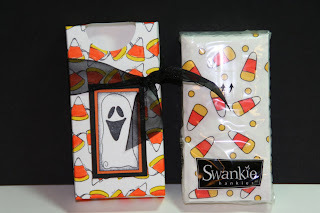 The lucky winner of this blog candy is Shelli and here is her post. Well since you didn't take me up on the goodies under my son's bed, perhaps you'd like the contents of his closet. Please keep in mind he is almost 17 so I'm not 100% responsible for what can be found in there but I have been storing some Christmas decorations in the back on the shelves that you might like. Of course you will need to dig your way through at least 2 weeks worth of teenage boy dirty clothes (I'll even throw in a container of Febreeze), several half finished homework assignments that never got turned in (his teachers might like those), 5 or 6 shoes that have somehow ended up without a match, 2 pair of inline skates without the wheels, 3 belts without buckles of course, 14 plastic cups, 2 styrofoam plates and a large container that fireworks came in. I don't believe there is any food in there, but there could be. If you find his wallet in that pile, feel free to keep the quarter and penny in it but please return his permit so he can continue his driving lessons or he may never be able to move out on his own. Gah! Congratulations Shelli. Please email me with your snail mail address and I'll get the stamp set in the mail to you. Thank you all for playing and check back on Monday for more Blog Candy! And Another Challenge Before Me! My dear, dear upline Sue (*winks*) challenged me to make a Boho Christmas card. So here it is Sue. I hope I didn't disappoint you! It just seemed wrong to color a snowman anything but traditional colors. I did get to play with my corner punch. I REALLY like it!!! Actually I used several fun punches here. The snowman is from the "Jolliest Time of Year" set. I am REALLY liking that snowman. Wait till you see what I do with him next week!!!! Can't even give you a hint, sorry!! I also used the clear brads that came with the "Pretties Kit." I cut the prongs off on the back so they would lay better and I affixed them with Crystal Effects. On the decorative paper I stamped in Blue Bayou using the Linen Background set. It toned it down just enough. 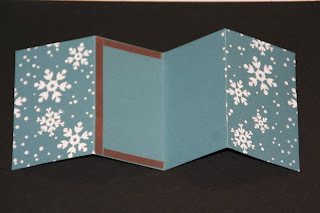 The colors of card stock I used here is Blue Bayou, Really Rust and Chocolate Chip. The snowman was stamped on watercolor paper and colored in using a blender pen and markers. Edges were sponged using Blue Bayou. Ah, it's Wednesday again!!! This was a very busy Wednesday for me. It starts off with the "guy" coming to fix the crack in my windshield after DH took my car to work on Sunday and a rock hit it. Did he tell me? Of course not!! We'll save that story for another day!!! LOL The time window is between 8am and 10am. Not a bad time span at all. But he came right at 8!! YIKES!!! I was hoping I had enough coffee in me to be human enough or to at least act human!!! LOL He got it repaired in a short amount of time. He did a great job and I went on my merry way cleaning. (I have stampers tomorrow and my workroom is, well lets say someone came in there and made a horrible mess!!! LOL). Then the 1 800 Got Junk people came. This was funny. I saw their sign on a neighbors lawn and my upline (Sue *winks*) said she used them before. SO yesterday I called them and asked the guy on the phone to define "junk." Thinking that my definition of junk may be different than theirs. He asked me what I had for junk and I rattled a bunch of the items off, including computer towers that somehow managed to make their way in the garage and multiply over the years. Funny how inadimate objects can do that. He told me it was junk they'd take and they could come out the next day. Isn't that great? So they came a while after the windshield guy and took the "junk" out of the garage. This was the best way to do it. I just pointed at the "junk" and they took it. I didn't even get exhausted from all the pointing!!! LOL It's the easiest way to get rid of your junk and I highly recommend them. And now I have spaces in the garage to fill in with the stuff that is taking space where my car is suppose to go!!! It all went so smoothly that it made my day! 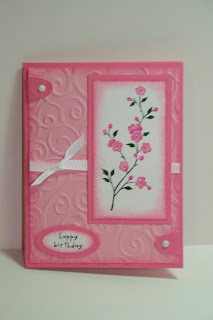 For this card I used the Garden Silhouette Hostess set and the Cuddlebug folder. 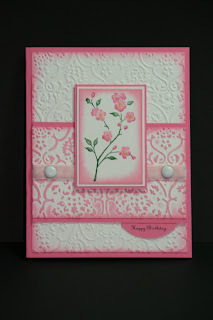 Pretty in Pink, Regal Rose and Whisper White card stock. I printed the Happy Birthday words out on the computer using the Regal Rose card stock and I punched it out. I added a little pink velvet ribbon and a couple of brads. The technique is Direct to Rubber using Pretty in Pink, Regal Rose and Garden Green markers. And of course I had to do sponging. You know me and that sponging!!! LOL It was a fairly quick card and a VERY fun sketch! If you have not tried one go on over to SplitCoastStampers, scroll down and on the right is the challenges for each day of the week. I have not ventured beyond Wednesday's sketch challenge. Maybe one of these days I'll try another one. It's always good to branch out and learn new things. A fellow demonstrator challenged me at our last meeting. It was an interesting challenge. She gave me a 5" wooden spoon and asked me what I could do with it. Stamping doesn't have to be limited to paper. You can stamp on a variety of mediums. Well Cyndi, here it is. I had limited supplies here. I would have like to have added some tiny holly leaves and berries but I didn't have any. But this gives you an idea of what you can do with it. 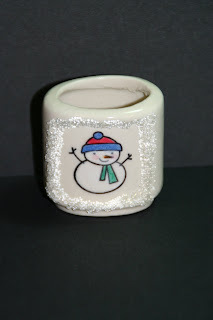 Here I stamped the snowman from the "Merry & Bright set by Stampin' Up! on tissue paper and affixed it to the spoon with Crystal Effects. It's pretty much the same technique as the "Stamping on a Pumpkin" technique is. I just added some greens and a bow and you have a quick ornament or wall decor. This would also be adorable with a gingerbread boy in the center and affixed to a handmade cookbook! There you go Cyndi!! I'm ready for the next challenge! I have not heard back from the Blog Candy winner so the candy will go back up for bid! It was SO fun the last time I thought I'd try it again. I'm sure you all have some useless "thing" sitting around you'd just LOVE to trade for the stamp set!!! LOL Your name will be put in a random drawing and I'll post your first name and your comment on a "Blog Candy Winner!" post. Drawing will be done on Friday evening October 19th. Yes, you can stamp on a pumpkin. Sort of. I suppose you could stamp directly on the pumpkin using Staz-on but you're limited as to what you can do. I like using the tissue paper method. It's quick and simple and your image turns out wonderful each time. Using the Black Staz-on, stamp your image on tissue paper. Color it in with colored pencils. You can use markers but you do have a chance of them bleeding in the adhering process. If there is an area that is to be white make sure you color it with a white colored pencil. Just because the tissue is white doesn't mean it will stay white on the surface you're attaching it to. Actually you don't want it to be white, then your edges would show. Once you are done coloring cut the image out. Make sure you cut very close to the edges. The more edge that shows the more it may show on your finished product. 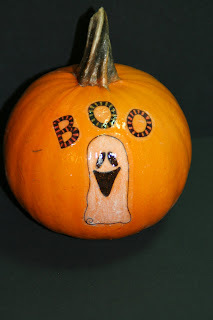 Take your Crystal Effects and brush some on the pumpkin in the area you want your image to go. Make sure you cover the area a little past the size you really need. There is no need to cover the whole pumpkin. Set your stamped and colored tissue paper piece in place. Dip your brush in the Crystal Effects and lightly brush over the image. Don't use a lot of pressure or it will tear the tissue paper. Should this happen take a wet paper towel and wipe everything off the pumpkin and start over. This happened to me once and it was because I thought I could go over the tissue paper a second time without it being completely dry. It was late and I just left it dry on the pumpkin. In the morning I was able to just peel it off. The pumpkin no longer had it's "natural" shine there but that was ok, I was going to cover it again anyway. Is it really a "natural" shine or is it something the seller rubs on to give them a little bit of a shine, like some type of an edible oil you know like the stuff they use on cucumbers? Ok, once you have a coat of Crystal Effects on the tissue paper you should begin to see the paper slowly absorb it and the edges blend into the pumpkin. The edges will show a little but you really have to look. On the pumpkin with the cat you can see the edges because I didn't cut as close to the edges as I did with the ghost one. I also didn't use brighter colors. The ghost one shows up much better. Have fun with this project. Care to share? Just email me with your finished products and I'll post them on here for you! I had some "stuff" laying around on my worktable that I thought I should try to use up. I have just a few pieces of scrap left from the Stampin' Up! Halloween decorative pa pers and I don't want to purchase another one this late in the month. SO I thought I should just try to use the scraps I had. The card with the ghosts has a scrap of Stampin' Up! paper and the one with the house has a piece of the Fiskars paper I had left from another card I made earlier this month. I have to admit, I think this is the first time I've used an entire package of decorative papers until all I had was scrap. Usually there's a sheet or two in the package that I didn't care much for but these were fabulous! It's always good to have "firsts!!!" These cards were pretty easy to do since they were mostly made from decorative papers and stickers. Yes, the center focal points are stickers. I used one the acetate box I made on the first of this month. You can see it here. I still have one more sticker left and a little bit of crap left too. Plus I have part of an evening left.... I guess that spells out "another card!" LOL That should make my Halloween card collection complete!!! This week is going to be a fun one. I have blog candy coming up for 150,000 hits! I'm just amazed! 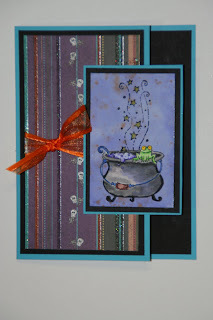 I have a fun tutorial coming up and some new card samples for you!!! There are two fabulous events here in the stamping group I am in. One is the Stamping Extravaganza in August which I was unable to attend this year and today's event The Demo's Gala (I think I may have the name of that event wrong). I'll correct it later if I do. Here is something fun I saw there that caught my eye right away. For several reasons. One, of course, it was a snowman on the front!!! And you know me and snowmen!!! Another reason it caught my eye was it had snowflakes on it (again, you know me!!) and third it was a gift card holder. Something I always need during the holidays. There's SO many people on my "gift card" list. 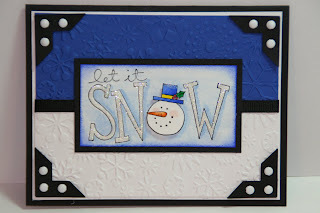 The original one was done on ballet blue and the snowman on the front was from the Stampin' Up! set "Merry & Bright." I used the jumbo "Snowflake" wheel and white craft ink. For the front I also embossed in white embossing powder. This is something that is VERY difficult to do on both sides. It can be done but you have to be extremely careful not to get any ink on the backside of the area you are working on. You need to put clean sheets of scratch paper down each time you roll the wheel across to avoid getting it on the back. And you need to be especially careful when you turn the card stock over to do the other side. The ink begins to absorb and dry and not to mention some transfers onto your scratch paper. And sometime sit dries before you get the embossing powder on. You have to be a bit speedy for embossing on both sides. Like I said it can be done but not by me. I'm too slow and not always that careful! SO mine is embossed on the front and back and the inside is just white craft ink. Do your embossing first and then the inside ink. Then set it aside so the ink can dry. Cut your card stock 4 1/4" x 10"
Score at 2 5/8", 5" and 7 3/8". Fold it like a fan. You will have a "W" shape. The center of the "W" is where the gift card goes. Pinch it shut and you will see what shows on the front and back. 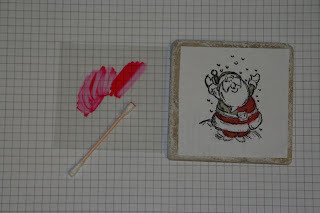 This is where I used the white embossing powder. 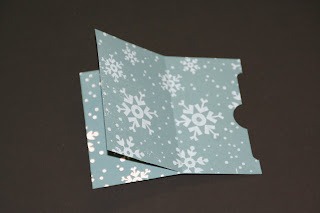 Once that was done I opened it back up and rolled on the snowflakes using the white craft ink. I set it aside and gathered the rest of my supplies. You will be taping the inside of the holder. I use the Stampin' Up! Sticky Strip tape as shown in the photo. Measure a 3/8" in on the taped piece and using the Word Window punch, you will be punching in only half way. Slide it down and punch again making sure you are 3/8" from the edge. You don't need to be concerned about getting them perfectly even. Close enough will do because you will be taking a 1" punch in the center. Go about 3/8" in and punch. See photo. You may have to adjust the distance between the edge and where you begin the window punch according to the size of your gift card but most should fit within these measurements. You can add any wording you'd like on the inside or you can leave it as it is. For the front I used the snowman from "Jolliest of Holidays". I stamped the image on watercolor paper using black Staz-on ink and I colored it in using a blender pen and ink pads. I added my ribbon under it before I attached it to the front of the gift card holder. Tie it in a bow and it's complete! See, not so bad is it??? You can view my other tissue holders here. 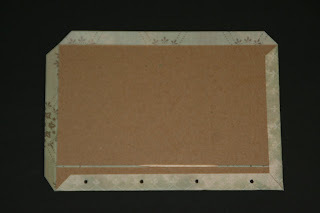 I got the pattern for the tissue holder here at Julie Ebersol's blog on Split Coast Stampers. Her user name on SCS is JulieHRR. I've had a lot of fun with these tissue holders. There's no end to the things you can come up on the cover for them!!! I have made TONS of these!! On this one I used a couple of stamps I got at Michael's for a dollar each. And nope, I didn't find them in their dollar section or the round bin where they have dollar stamps. These were right up by the register when you wait in line to check out. I was just looking around and my eye spotted this huge pile of rubber stamps. 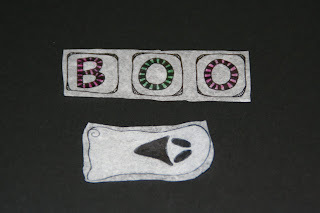 Halloween rubber stamps and the shelf tag read $1.00! Well, my eyes lit up and I couldn't wait to get closer to the check out so I could look through the pile of stamps. What fun to find cute rubber stamps for only $1.00 each. I wanted to make a quick tissue holder but I just had to color in the candy corn and that took a little while to do. You can't have colorless candy corn now can you??? LOL This is one of the items I'm adding to my basket of "stuff" I'm going to let my stampers pick from when they come to stamp this month. I am getting WAY too much stuff just sitting around here and I came to the conclusion that I only need one tissue holder as a sample! SO I'm giving away a lot of my samples this month! My scariest/funniest was when we worked in an office and all of us dressed for Halloween. We used to stuff my husbands old clothes like Jason hooded sweatshirt/jeans/tennies and set him in the corner or hang him in the stairwell or elevator - everyone had a sense of humor until we had him sitting in the corner next to the mail bins. One day, one of our coworkers took the stuffing out and put on the clothes. He sat in the corner and scared an unsuspected woman coworker. Needless to say I have never saw someone jump so high in my life and I don't think I laughed so hard either. Thanks for the blog candy!! SO Bev, please email me and I will get your package in the mail to you. Thank you all for "playing" but not to fret. My blog is about it hit 150,000 this weekend so there will be more Blog Candy. I have more stamp sets!!! I would have to say that about 99% of this card is cased from Melissa at Simply Pink. Click here to see her wonderful card. I told her I was going to case her card. I liked it the minute I opened her blog and saw it. I am glad I was able to find some time to copy this card. Isn't it pretty? I added ovals on the sides instead of the word window punch piece. I did that because I wanted the words on the side of the card and I used ovals so it just tied them all in together. The flower stamp is from the "Garden Silhouettes" set, the Happy Birthday words came from the "Here, Kitty Kitty set both by Stampin' Up! I didn't have the velvet pink ribbon like Melissa used so I added white grosgrain. I did try to use pink organdy but it blended in too well and got lost on the pink. White seemed to stick out better and tie (no pun intended LOL) it all together!!! The technique here is "Direct to Rubber." I colored directly on the rubber with markers, adding each color separately. Once done I huffed on it so the steam of my breath moistened the ink. It does dry out while you are working on other colors. And I sponged. A fairly simple card! Stop by Melissa's place and say hello!! Blog Candy drawing is tonight (Friday). Click here to leave your story for a chance at the candy! 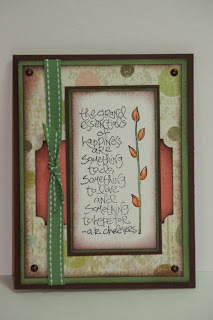 Anyway, here is the Sketch Challenge at Split Coast Stampers. Here's the shocker with this card. It's NOT a snowman one!!! Can you believe it? 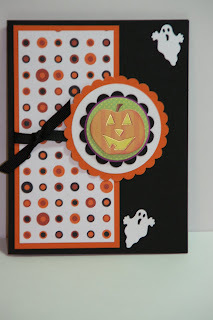 I had the "Haunting Halloween" set by Stampin' Up! sitting on my worktable and I glanced over at it and immediately knew the cauldron and "steam" would work in the space provided. SO I put the set together and played with it. I LOVE the background paper. I got it at Achievers and it's by Fiskars. So here it is! Those little white things on the background paper are skeletons. To me they look like they are pole dancing. LOL Click on the photo for a closer view. 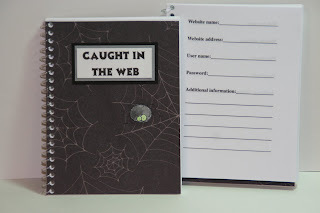 Here is the PDF file for the "Caught in the Web" notebook. 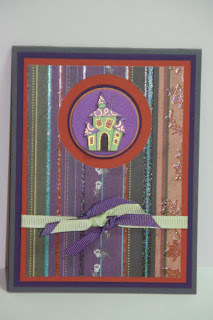 Just click here and you will be magically taken to the place on Split Coast Stampers where it's now residing! Subscribe to a lot of websites and have a LOT of passwords to remember? I sure do. SO I designed this little book that will hold the information I need. Including those elusive passwords. Click on the photo to see a closer view. 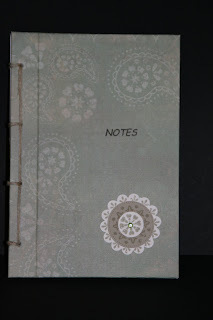 The cover of the book is made using some fun decorative papers I found at JoAnn's. I did the words on the computer and the spider is from the "Booglie Eyes" set by Stampin' Up! Though it doesn't show up very well in the photo. I have a PDF file for the pages all ready to go and I will be posting this book on SplitCoastStampers and adding the link here. Blogspot doesn't have a feature that will allow me to post the PDF file here. I'm working on getting a spot on a website to hold all of my PDF files so you can you will just be able to click a link and find every one of them. Hopefully that will be up and running by the end of the month. It's a pro-bono job so it gets done with the webmaster has time. The PDF file for the pages can be found by clicking here. It is now residing at SplitCoastStampers . I was playing with an old stamp and some new background paper. The stamp is called "Ghostly Gale" by Penny Black. I REALLY like the Penny Black company. It's one of those companies that don't have a problem with you selling what you make. Just the usual stuff, giving credit where credit is due. This is one set I like to make pins with too. I'll give it a tutorial try this week and post it later. The background on the ghost image is that new polished stone technique I will be posting soon too. It's such a fun background! I added a bat brad in the corner. It just looked like it needed something up there. I attached it using the Crop-a-dial. I am finding more uses for that tool. A wonderful investment. It punches though not only a few layers of card stock but through chipboard and even tin cans!!! I stamped my image on white card stock. Shocker it wasn't watercolor paper, huh??? And I colored it in using a blender pen and markers. I cut the image out with the snips and I had to glue it in place with the Anywhere glue stick. The glossy card stock doesn't really like to hold tape as well as gluing the item in place. I also glued the sky piece onto the black piece of card stock. When you do the polished stone technique on the glossy card stock the card stock curls up while it's drying. I taped the polished stone on the black card stock. Went to get my snips and cut out the ghost image. I was going to attach it and noticed the glossy card stock was curled up again. SO I HAD to glue it! It's a pretty cute card but an even cuter pin! I will be showing that later this week so stay tuned!! I was suppose to post Blog Candy last week but with getting ready for a nice long weekend I postponed it until this week. Well, it's now officially Blog Candy Time!!! I just got a HUGE order of stamp sets so I'm good with Blog Candy for a LONG time!!! Well, as long as you are liking stamp sets!!! What stamper wouldn't like a free set???? This Scrappy Cat stamp set theme is "Birthday." Everyone knows someone with a birthday!!! One (I have SO many!! LOL) of my scary Halloween memories was one as an adult, if you can believe that!!! LOL A friend of mine had invited me over to her place on Halloween night. She wanted me to see this house that decorates SO much for the evening. The yard was full of activity. There was a tombstone in the yard. A witch stirring "something" in a huge cauldron with the dry ice smoke coming out of it. There was music playing and black lights flashing. There were spider webs around the corners of the house and on the trees and shrubs. There was a hole dug in the ground near the tombstone (they actually dug up their lawn for this). The dirt was piled next to it as though they were waiting to put someone in it and cover them up. Then the wolf man came around. The homeowner had a full beard and he wore a striped suit. He was very impressive with the fangs and all. Fabulous job on the hairy hands and fingernails. So that's the picture in your mind of the yard. As I walked over to the grave near the wolf man right behind me a chainsaw fires up, I jump, turn and of course it's Jason Voorhees from "Friday the 13th." Mask, mechanic's clothing, gloves and not to mention that darn chainsaw (blades removed). Scared me out of my skin. My girlfriend is laughing at me because she knew what was coming. We're no longer friends. LOL Just kidding. I just no longer go over to her place on Halloween!!! LOL SO after she had her laugh and I got my heart to beat normal we started to leave. We're a few houses down the street and that darn guy starts up that chainsaw behind me again. LOL I couldn't believe he got me again!!! LOL SO that's my scary Halloween memory! The lucky winner's name will be drawn through the random number generator on Friday evening October 12, 2007. Shopping Notes on "Buckets of Fun"
For those of you who don't have Dollar Tree's near you and you're looking for those little buckets I have seen them in the bridal section at Michael's. Maybe JoAnn's would have them too. I don't usually go into that section of the store. More scary than a Haunted House!!! LOL And you can always just Google the words "white bridal buckets," "white mini buckets," "white mini bridal buckets" (you get the idea) and see what comes up. I often Google many items I'm looking for. I LOVE bath salts. 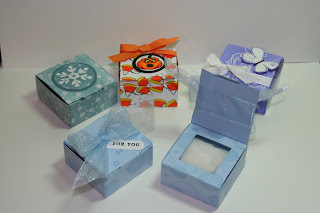 And what a better way to display them and sell them than in an adorable box created by you! This box is done much like the acetate box but this one only has two pieces to it. Cut your card stock 8 1/4" long by 5 7/16" tall. Score like you would for the acetate box at 1 15/16" inches 3 times across. Score the bottom edge at 1 15/16" Follow the directions for the rest of the box here. I used a wheel and wheeled on white card stock. I punched a 1 3/8" hole for the window and added a piece of acetate, attaching it with Tacky glue. I also used Tacky glue to put the box together with. I figured I had the glue out anyway! I'm SO lazy!!! LOL I made the cover and glued it also. I did not punch holes in the side of the box or lid to tie the ribbon on with. I just wrapped the ribbon on the outside of the box and tied it into a bow. It gave it more of an elegant look having the ribbon go all the way around the box. I added a little Bayou Blue bow on the front of the box. It was just enough to keep it looking feminine enough. I filled a little 2" x 3" zip bag with bath salts and put it inside the box before I taped it up. The recipe for the bath salts can be found here. It is now ready for gift giving, craft fairs or to do as a Make N Take or for Stamp Camp. Lots of uses for this item!! 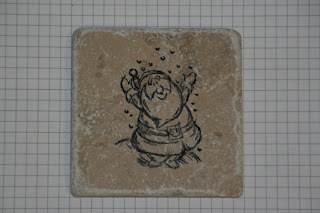 I was asked by one of my readers about how to stamp on a tile. For this project I used a smooth non-glazed tumbled tile. 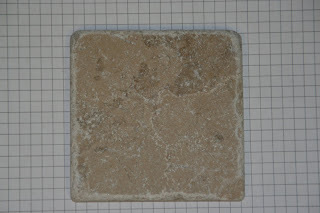 This tile is more or less a raw tile. There is no finish on it at all. To prep the tile you just need to wipe the surface down with rubbing alcohol and let it dry. Once dry you are ready to stamp your image. Be sure to use Staz-on ink for this. You don't want it to come off with just a drip of water. 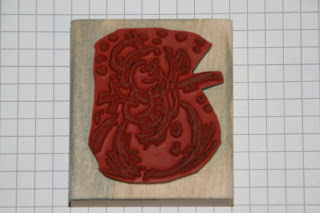 Before you stamp your image on the tile stamp it on a piece of white copier paper. This will serve two purposes. One it will let you know your "touch" on the ink pad. You will see if you need to press harder for more ink or give it a lighter tough because you have too much ink on the stamp. You only have one shot at this and you want to get it right. It is extremely difficult to remove the Staz-on from the tumbled tiles without some residue being left behind. Now I have not tried the Mr. Clean Magic Eraser Sponge on this so I can't tell you if it would help but it would be something I would try if I needed to. Using glazed tiles is different. The Staz-on does come off with rubbing alcohol. And the second purpose of stamping the image on copier paper is to give you a mask to work with. I cut away all the parts I want red. You will be making as many masks as you have colors to add. Cut one for the red clothing, one for the shoes, belt and mittens, etc. For my colors I used colored Sharpies. Nothing fancy and nothing expensive. 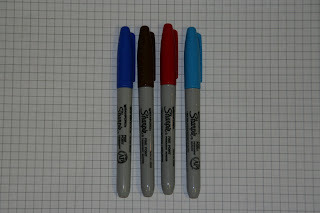 They are a permanent marker and work fine for this project. Here you see how I was coloring in the areas. After stamping my image on the tile and cutting out the pieces on the copier paper I lightly taped it in place on the tile. I took a red Sharpie and colored on a piece of acetate. You need to work a little quickly here but not frantically. If the marker on the acetate dries just color more in a different spot and continue. Pick up some of the marker with a cotton swab and dab in the areas you want that color. Continue until you have all areas covered. Carefully pick up a corner and see if you like the color. If not, put it back down and add more until you get the darkness you like. You can also do shading in areas this way too. Adding darker where you think it needs it. Here is my finished tile. I added some pink cheeks by touching the tip of the cotton swab on my alcohol wipe and dotting it on the cheeks and nose of Santa. The blue around Santa was done the same way. The rubbing alcohol dilutes the color a bit to give you a lighter look. For the "sponging" of the edges look I colored blue on my acetate and picked up the color with an alcohol pad and used it like a sponge. A cotton ball will do just fine too. Keep it fairly wet but not sopping. You don't want it dripping down your arms but you want it wet enough to work with. If you want to seal this I suggest you use a clear acrylic spray. You need to be careful with this because it will lift the colors right off the tile and cause them to run, bleed and drip. Start out about 2 feet away and give the tile a quick sweeping spray across the tile. Hardly anything will get on the tile. That's what you want. You will want to let it set for a couple of minutes and then repeat it several times. Then you will move in a little closer. Always use quick sweeping motions. Don't spray directly onto the tile, too much spray gets on it and you will not be happy with the results. Start off to the side of the tile and spray across to past the tile. Do this outside and in a well ventilated area. To avoid any spraying at all you can take clear contact paper and cover your tile. This is something that can be replaced in time. With the acrylic spray your surface can still get scratched and ruined by whatever gets set on top of it. And if you're just going to mount it on a plate hanger then you don't need to do anything to it. Click on the photo for a closer view. I hope you have fun with these and if you'd like to share what you make email me a picture of your tile and I'll display it on here. Cleanliness is Next to Impossible!!!! LOL It's difficult to keep your stamps 100% clean without spending a lot of money on cleaners that you have to be SO careful with. It's good to be on the careful side with any cleaners but when they require rubber gloves I tend to back off from them. If rubber gloves are needed for my skin, should I be wearing a mask so I don't breathe in any fumes??? Red flags fly there and I look for an alternative. 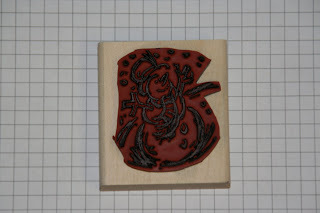 Here is one of my stamps I just recently stamped with Staz-on ink. 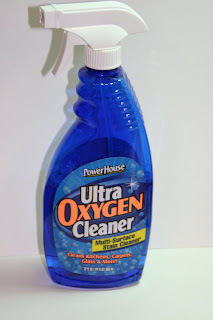 I used this fabulous cleaner that I got for $1.00 at the Dollar Tree. I sprayed it right on the Stamp and Scrub pad and rubbed the stamp in it. And as you can see it got it extremely clean. Not brand new clean but pretty darn close. But there is one more step I take after I get it cleaned. I spray my stamps with the Stampin' Up! Stampin' Mist. I don't feel it cleans off the Staz-on very well but it does keep my stamps from drying out. I use it on all of my rubber stamps, including non-Stampin' Up! ones. It's important to keep that rubber from drying out. Once that happens your stamps are no longer any good. You can not bring the stamp back to life either. SO it's best to take care of them from the beginning. Here's the stamp cleaned up. Not 100% but pretty close! Take care of those stamps, they are an investment! Plus when you go to sell them, if they look wonderful, clean and not dried out you'll get a decent price for them. I got these adorable little buckets at the Dollar Tree. And yes, I just recently purchased them. Nothing I had in a drawer for a long time and just ran across. It's an item you can still find in the store. Better run now!! They may go fast after you see what you can do with them. These are in the bridal section. Not my choice of uses for them but that's just me!!! I saw them and a some stamps immediately came to mind. I went in the store to pick up a plastic container and I just happened to go down that aisle only because the aisle I wanted to go down was very congested with shoppers. I think I need a pair of blinders so I can stay focused on my shopping!!! LOL Anyway, I only picked up one package of them and went home to play! I stamped my design on tissue paper using Staz-on black ink. Then I colored it in with markers. I cut the design out making sure I was no more than 1/4 inch from the edge. I didn't want the tissue paper to be visible. I adhered the tissue paper onto the bucket with Crystal Effects that I put on with a paint brush. I covered the design with more Crystal Effects and then sprinkled it with the 5 mm clear micro no hole beads. These are the same beads you'd use for the decorative beaded pens. I set them aside to dry. Now that they are dry I will tie a bow on the handle and make them even cuter!!! This was very difficult to take a picture of. The beads kept reflecting on the flash. I should have taken the photo outside in the daylight but today we had rain!! Maybe I'll try a new photo tomorrow outside and see what I get. For a closer view just click on the photo. 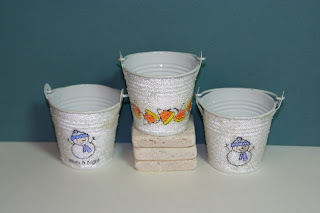 The beads give the bucket a frosty look but yet allows you to see the design. You can whip up a bunch of these in no time. The most time consuming part of this project is waiting for the Crystal Effects to dry. Best to just do them and tie the bows on the next day. The buckets cost you under $.40 to make. Nice profit margin on them if you're looking for a fast money maker at a craft fair. 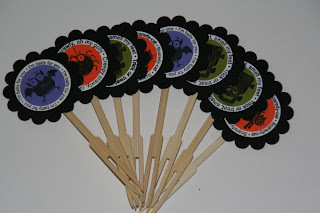 These are also great for party favors, Halloween Gifts, Hostess Gifts, Customer Appreciation Gifts, Halloween Gifts, Christmas Gifts, Christmas Parties and the list goes on!!! You could even hang them from the Christmas tree as an ornament!! A Box of Eyeballs You Can Clearly See!! !